LeannM had the most liked content! Grandchildren!!! Hand and machine embroidery, stained glass making, sewing, quilting, music. When I heard the news I contacted the magazine. I had a quilt featured in it in 2015 and asked for the same number of copies of that magazine issue as were left on my subscription. I wonder if some who have subscription left would ask if they could get older issues they don't have to fulfill their paid subscriptions? Well, I don't know about being as good as a computer, but thank you for the lovely compliment! Thank you SCS! That's a lovely compliment. Thanks for you lovely comments, everyone! Thanks, Cagey. The white area is not a panto it is freehanded. 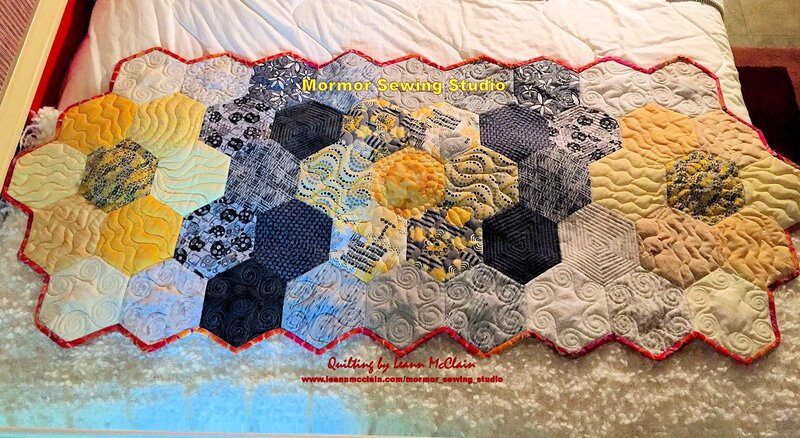 I finished this quilt recently for a client. She absolutely loved the way it turned out. It's great when the pieces fall together and the client celebrates the job with you!!! Love this! What a fun quilt! LeannM replied to Pepsi Girl's topic in Ask The Expert - How Should I Quilt This...? Swirls and feathers to make the stars dance! What a pretty quilt. Those white spaces are all the invitation I would need to insert a cute quilting design!